The team of engineers in Table Group M created two games for their software design project, one of which was a version of the game “Hangman” and an adventure game. The main purposes were to produce games for overall entertainment, but also to test the coding skills of the team. Next, they had to market their creations and show that they had created the best games that were made with Matlab coded functions. 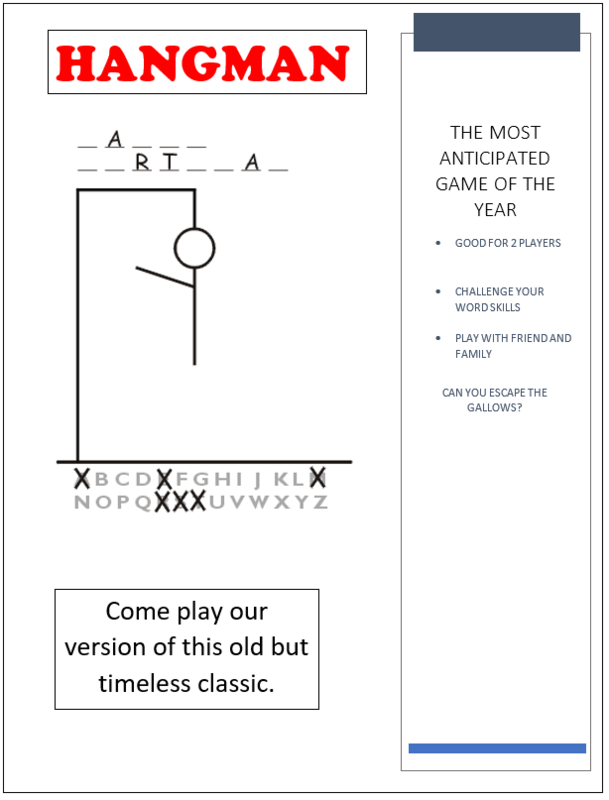 They designed “Hangman” so that two players could enjoy the game, with player one entering the word and player two attempting to solve for the word. The code was designed so that player one could only enter in one word instead of an entire phrase or sentence. Once the chosen word had been entered, a blank array was then printed with the appropriate amount of dashed lines representing the missing letters. Player two had the opportunity to incorrectly guess six times before losing the game. After each incorrect guess, an image of gallows with assorted body parts began print on the screen. The order that the images printed were head, torso, left arm, right arm, left leg, and right leg. At the end of the game, player two was notified of a victory or a defeat. The other game that the team created was an adventure game titled “Moonstruck,” each allow user to go on daring quests through outer space. Music and images for the game were inspired by a game from the late 80s called “Castlevania.” One of the techniques used to code was that the scripts for the character introductions were printed in a function file instead of the traditional “fprintf” statements. The text boxes for the story line were printed as images, which allowed neatness in the script file and required far less lines of code. The user of the game had the chance to play as one of three characters: Lycan, Vampyr, or Human. Each of the characters had special abilities based off conventional folklore. For example, the Vampyr could be easily harmed by sunlight, which posed a large concern since the game took place in outer space. The quests were not given concrete endings of victory or defeat. Instead, the team attempted to show how decisions that people make can affect whether they become more like the rest of society or freer as individuals. The outcomes could be up to the interpretation of the player as to whether they wanted to become free, societal or neutral. The team was success in there attempts in creating two fully functioning games in Matlab. “Hangman” was a good introduction for the team and allowed them to make their own interpretations of a classic game. 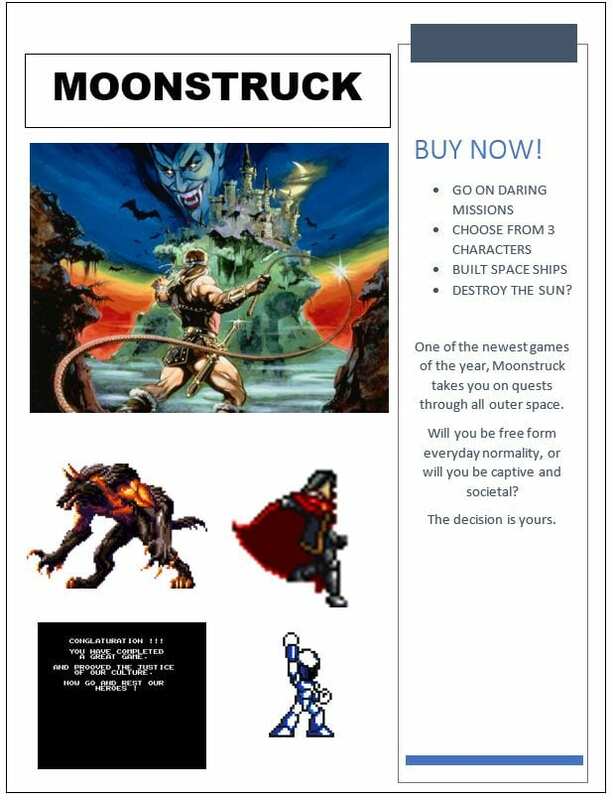 “Moonstruck allowed the team to show off some of their creativity and more of their coding skills. They used creative ways to create blocks of text that helped make the overall code in the game neat and tidy. The groups received excellent reviews on their work. Starting back at the beginning of the product, we knew we would want to get extra credit for this project, so we immediately aimed for six “game points”. We decided to split the points for a two-point hang man game and a four-point adventure game. The hang man game was relatively uninspired, so we quickly and easily made code, graphics, and even bug tested within the first few days. With that out of the way, we moved on to the planning of the adventure game. 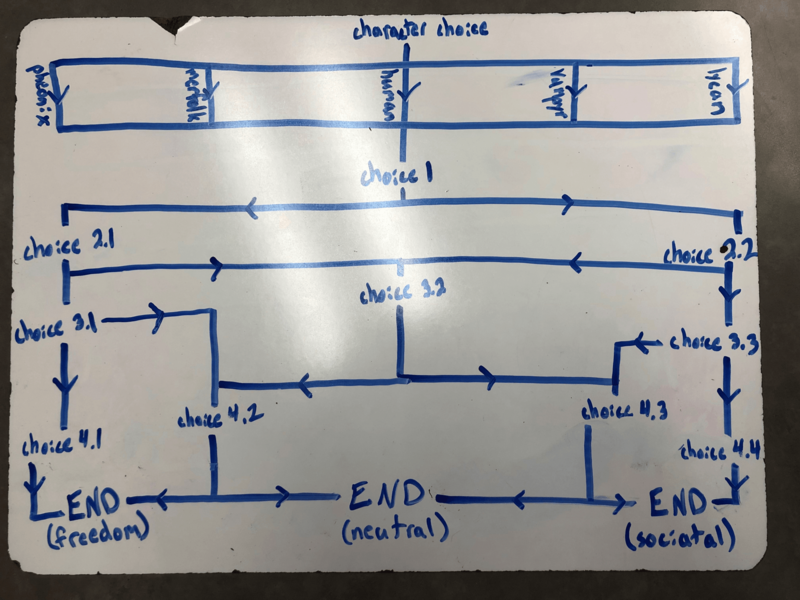 We brainstormed ideas about a stats system, but ultimately decided on a 5-choice based tree in a Zork style text-based adventure. The group, at this point, split into two coders / bug testers and two miscellaneous workers. The coders would spend their time figuring out the code and testing runs while the other two would build the descriptive script for all choices, update the notebook, create advertisements, and other business related aspects of the project. The dynamic of this team is very powerful. With a clear goal in mind and some motivation, we can get anything done. Our team managed to split the work as evenly as possible in such a way that everyone pulled their weight to receive a great end product. Everyone showed up outside of class to continually spend time on the games. Should we have more time, we would’ve liked to add more graphics, some more music, and most importantly a more expansive game. Such ideas for a larger game included bosses, random encounters, and more mysteries. We recommend that teams spend their time together outside of class often, like this group has. It not only builds team workability but also friendships, and it is much easier to work with a friend than an acquaintance. We also recommend to work hard, even when it’s inconvenient. Too many times we would meet outside of class at strange times, but eventually we would all be there to work together. Even if one of us were to not show up at those meetings, much less and less would’ve been accomplished. Cam and Brennen worked together over several days to construct, debug, and perfect the entirety of the MOONSTRUCK code. It was completed. Michael independently wrote each and every flavor text paragraph for the entirety of all three character options within MOONSTRUCK over the course of week. Stephen created a PowerPoint and script for the SDP video. The whole team split in pairs to record the final SDP video to be edited by Stephen. Michael created some new flowcharts that the characters could take. The idea was to create different outcomes that would lead the character to “freedom,” the most desirable outcome, “neutral,” and “societal,” the least desirable. The decisions that the player makes can lead the character down either of these paths. 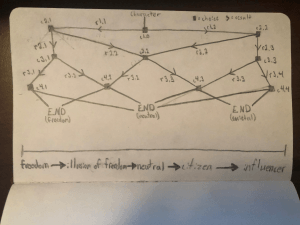 It is up to the player to make the choices and they have few opportunities in the game to lead towards “freedom.” Even if they are on the path towards “societal,” there are junctions that can lead to different outcomes. Brennen worked on making pixel visual images of all the characters. These graphics will pop up after the player has chosen their character. Brennen also created some opening theme music, as well as some theme music for all of the characters. These songs will play once the player has chosen their character. Cam made several attempts in putting the paragraphs of text into the game. Part of the problem was that the paragraphs were so large that they took up the entire command window. He developed a new way to insert text as images so that it would fit. This resulted it many trials of ingenuity. Michael created and began work on the final choice key and paragraphs of flavor text. Stephen created and submitted the SDP sides draft for the entire project. Stephen and Michael created interview questions to ask Jason Weible. The results were recorded, written down, and added to the site. Cam and Brennen searched the internet for sprites for the adventure game characters. Sprites were selected and created. Stephen and Michael spent their time thinking of the story and updating ideas. 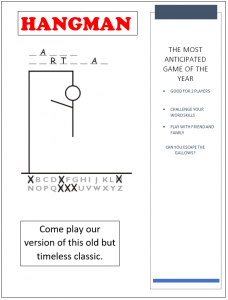 Did you enjoy playing our hangman game? Was the length of our game appropriate? Why? What did you think of the game’s graphics? What aspects of the hangman game made it enjoyable (or not) to play? Any suggestions to improve the hangman game? Do you like adventure games? Given the option, what would you play as in an adventure game? Lycan, Vampyr, Human, Merfolk, or Phoenix? Why? What do you expect from this character choice? What abilities do you associate with your choice? What about the others? Does one person have the power to change the entire world? What about the entire solar system? Why? What are you afraid of? What dangers do you expect to encounter in space? Do you FEEL free? Do you think everything you do is your own unaffected choice? Have you ever heard of or played Castlevania (specifically the NES version)?